I didn't think much of it because we have very hard water where I live and eventually everything gets hard water buildup and starts looking like this. 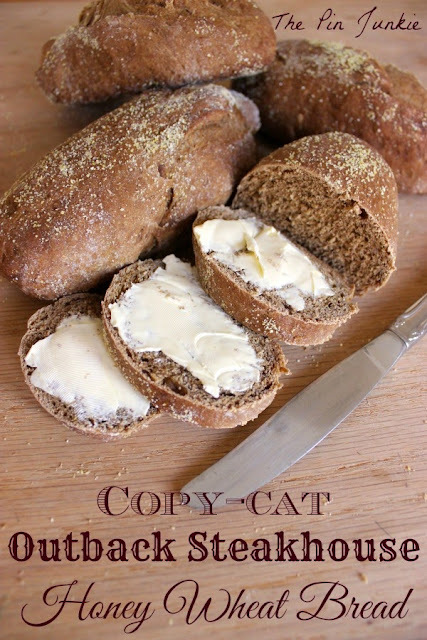 But then the same white crusty buildup started showing up on the dishes. After talking with some friends, I discovered I'm using the wrong dishwasher detergent. It turns out, you can't use the cheap stuff and expect good results. DUH! Well, I feel dumb now. So I'm not using the cheapest powder on the supermarket shelf anymore and I'm now using Cascade with Dawn action packs instead. That's what was recommended to me, and (surprise!) it really does a good job of cleaning the dishes and doesn't leave a yucky white residue on everything! Now I just had to find a way to get rid of the crud in the dishwasher and on the dishes. 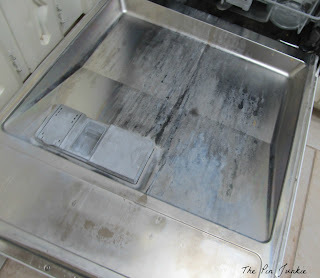 I have several pins on my For The Home Pinterest board on how to clean a dishwasher. Several of them said to set a cup of vinegar in the top rack and run the dishwasher through a cycle with just the vinegar and no dishes. I did that, but it didn't really do anything to the caked on crud on the dishwasher door. Next, I tried using baking soda and scrubbing with a sponge. 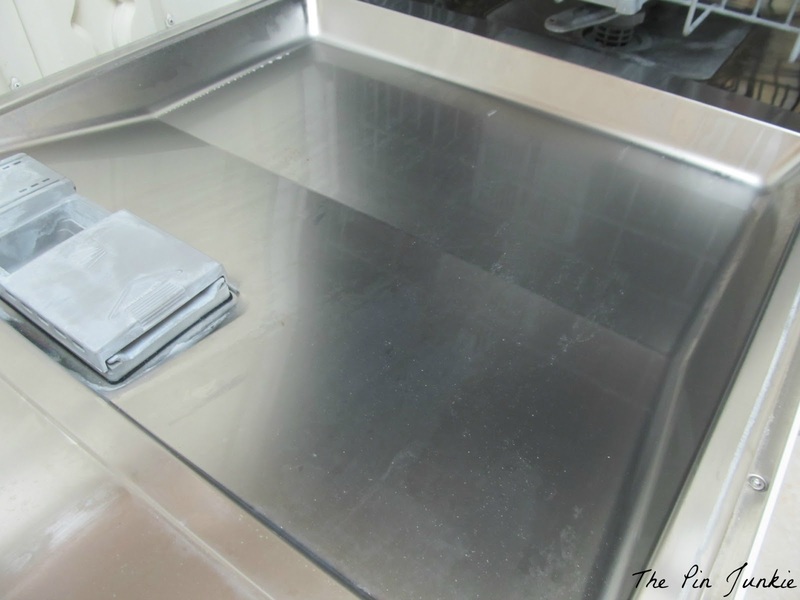 I scrubbed carefully and not too hard because I didn't want to scratch the metal. That seemed to help a little bit, but still didn't remove everything. This cleanser is a lot like Soft Scrub and it's great alternative to use in the dishwasher since everything I read said NOT to use bleach or any type of cleaner with bleach on stainless steel. I thought this cleanser sounded promising because the baking soda by itself seemed to be scrubbing off the gunk and the Dawn was already in the action packs. 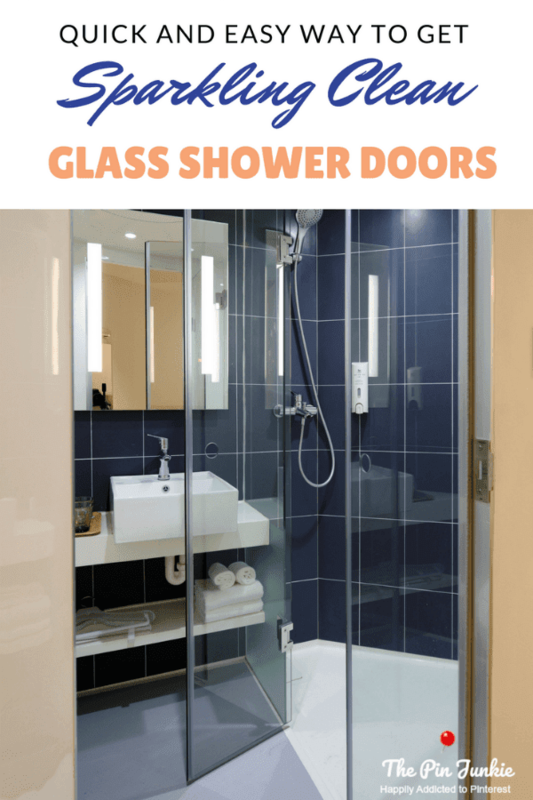 Dawn also did such a great job cleaning the glass doors in the shower I thought I'd give it a try. 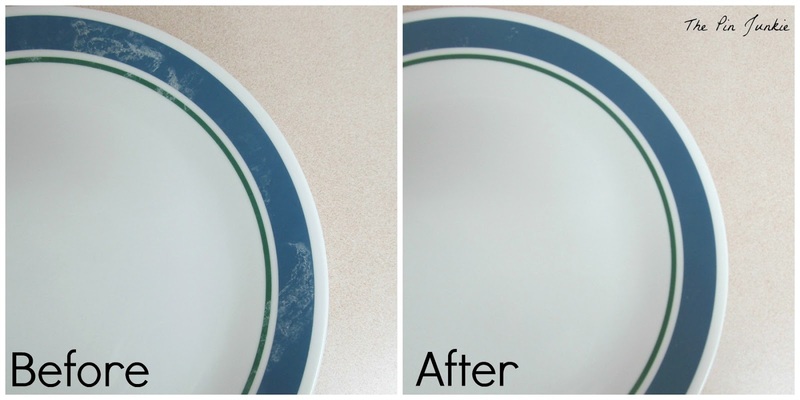 I also used this homemade cleanser on the plates and it did a good job of getting rid of that white residue. I know the title of this post is cleaning the dishwasher the easy way, but I'll be honest, I did have to use some elbow grease and really scrub. Stuff didn't just wipe off like in the posts about how to clean the shower or how to clean the stove. I had to scrub the dishwasher three times before I was happy with it. Remember what it looked like before? After a few good scrubs, here's what it looks like now! In a nutshell, here's what worked for me. 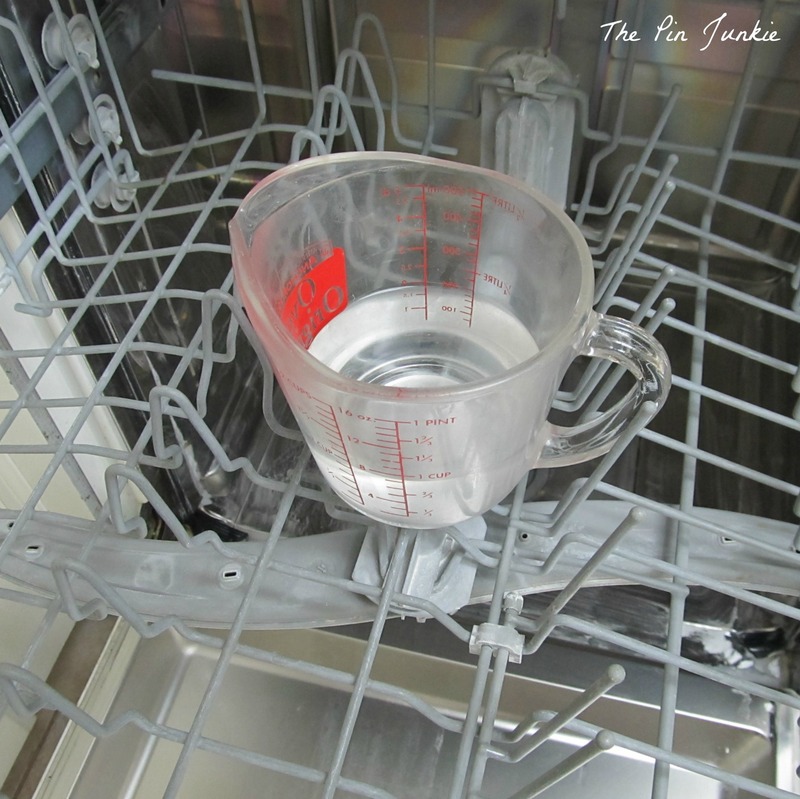 Keep in mind that all dishwashers and water conditions are different and you might get different results. 1. Don't use cheap detergent! 2. 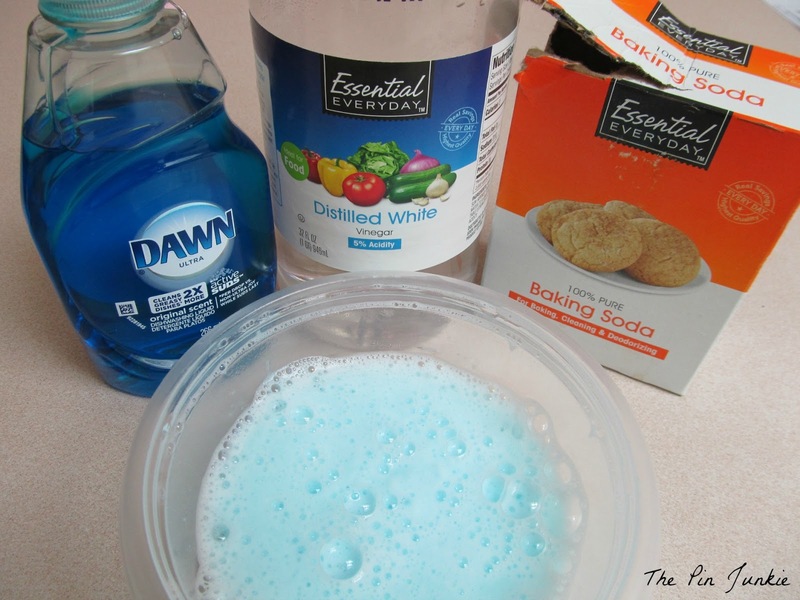 Mix up your own scrubbing cleanser with baking soda, Dawn, and white vinegar. 3. 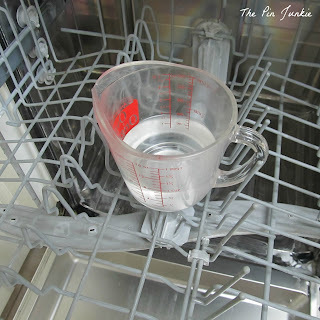 Gently scrub the inside of the dishwasher. Scrub carefully so as not to leave scratch marks on the metal. If you're really worried about it, you can do a test in a small spot before doing the whole door. 4. After scrubbing, I wiped down the inside of the dishwasher before starting a cycle. I didn't want the Dawn dish soap to suds up during the cycle. I ran the dishwasher with a full load of dirty dishes after each time I scrubbed, hoping that the hot water would remove anything that had loosened up after my scrubbing. 5. Repeat again if needed. I did this three times before I decided it was clean enough. That would be great Shannon! I have so many cleaning how tos like this pinned on Pinterest, but have I actually done one of them? Nope. 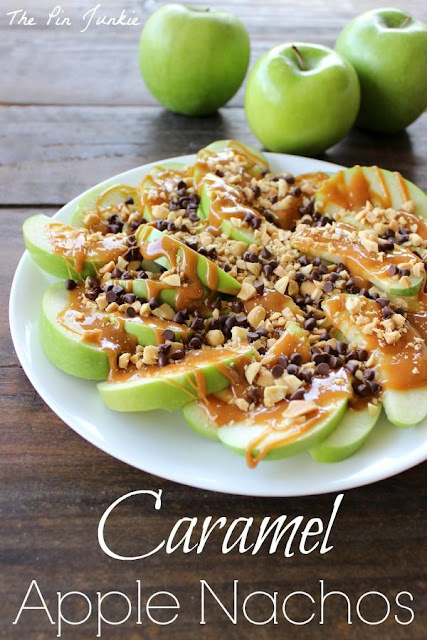 I'm really just not in the mood, but I feel better seeing other people's success on Pinterest. Hey, did you know that your blogger ID is not attached to your profile? I had to Google "The Pin Junkie" instead of clicking on your comment to go to your profile. I thin you need to make your profile public so everyone else can see it and click through to your blog when you comment on blogs. Hey Jill! I've been reading your blog for a couple of years, so I'm thrilled that you stopped by to read mine! Thanks for the heads up about my blogger ID. I'll try to get that taken care of ASAP. I spent a couple hours trying to clean hard water stains (red ones) from my white dishwasher just yesterday. I wish I'd seen this sooner! Good tips! I learned the hard way too that the cheap stuff has bad results. Thanks for sharing. That is a great tip. I love the little packets of detergent, they really *do* work better.. I definitely has less white build up. I need to see if this works to get off what I do have though! Thanks for sharing. 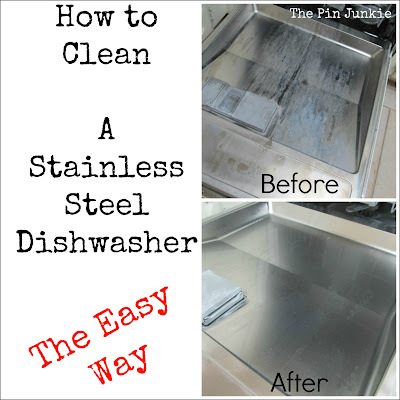 Every one of knows that stainless steel is the best material to be used in the kitchen. I know it needs more attention and cleaning issues, but as you have provided the solution for that problem, now it will be easy to use it and it will be beneficial for everybody like us. G'day! I have tried this before too! 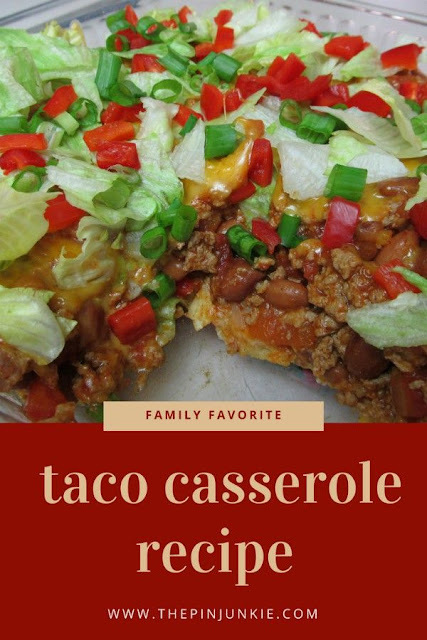 And know it is a GREAT suggestion and glad as a reminder and as part of the Happy Day Linky Party I got to view! I absolutely, wholeheartedly, agree with your conclusions! 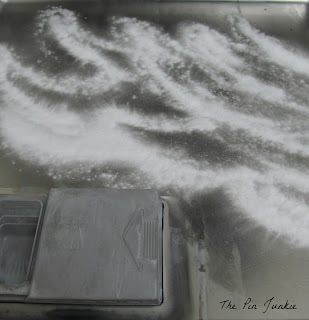 I tried homemade dishwasher soaps, cheap detergents, 'other' brand dishwasher detergents, back to Cascade to stay. Thank you for backing up my own conclusions! And Dawn is a staple for those extra tough jobs around here. I'll be your newest follower on pinterest - can't wait to start pinning your great ideas, thanks! oh, and, my dishwasher door looks just the same as yours - we put in a water softener when we bought it and that made a huge difference, as well. I had the same issue -- plus -- ahem "odor" -- like smell it across the room stinky! after I switched to an organic detergent. I tried all sorts of things to clean it with no luck. I ended up using a chemical cleaner the manufacturer recommended and just happened to see an article that talked about the different formulations of dishwasher detergent so I started trying different brands. I found one that worked with our water and have had no problems since. Wow, what a difference! Really looks great. Dawn works wonders for so many things. Thanks for sharing your tips with SYC. Thanks for sharing these tips with us at LOBS! 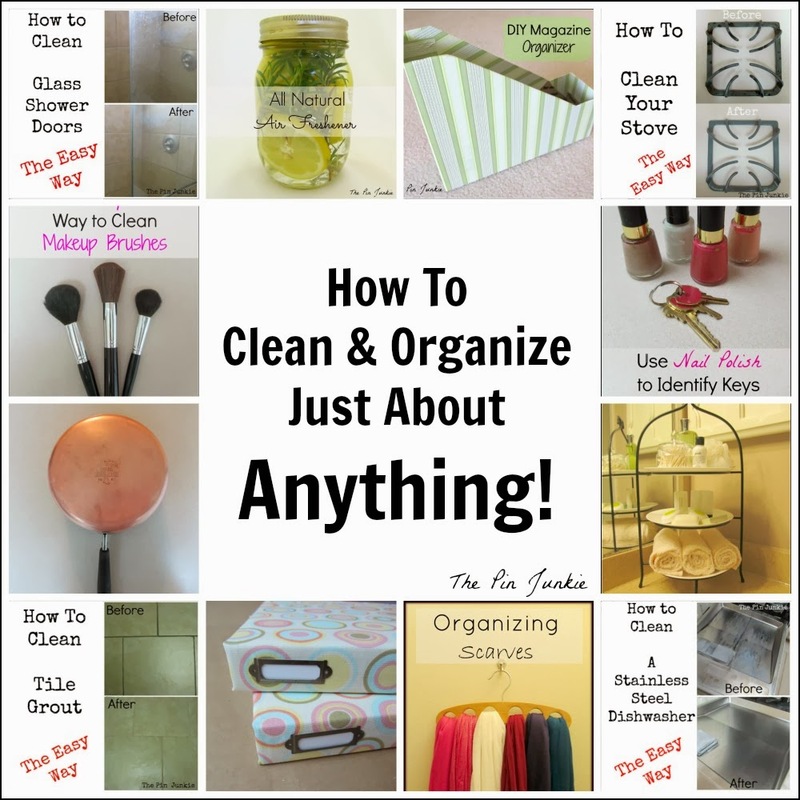 I am always looking for solutions to my cleaning problems!! Pinning and sharing this now! This worked great for me! Thanks so much! 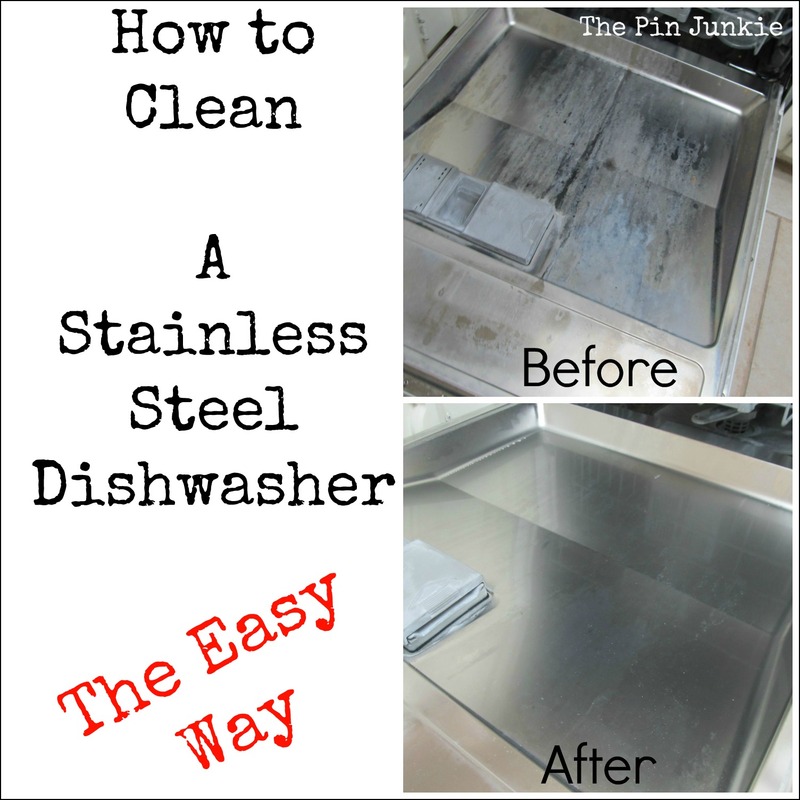 Thanks for the information on how to clean a stainless steel dishwasher! Mine is definitely looking like your "before" picture right now. 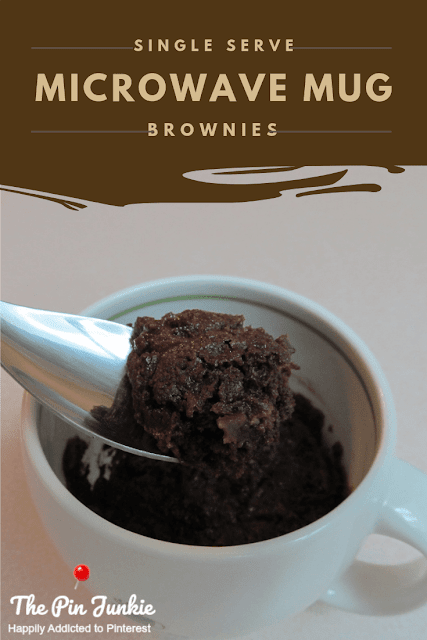 I'll definitely try your scrub recipe this week! Hi! Hoping to still be able to use an environmentally-friendly dishwasher detergent whilst avoiding scale build up. Those who found something that worked (whether enviro-friendly or not) would you please share the brand name? Maybe those that didn't work so well, too. Let's share b names. The scale got awful on mine using Meijer brand automatic dishwasher gel (although it did take a while to build up). I just saw a post where the person had hard water build up around and on the faucet. They soaked a rag in white vinegar and wrapped it around the faucet. Then poured the left over vinegar from the bowl into the rag to make sure it was completely soaked. After letting it sit for an hour the hard water deposits came right up. Im going to try it...maybe it would work in this case??? Lemishine works like a charm. We had trouble with a dishwasher that was all coded and all the dishes were too, recommended by the appliance repairman. First you run the dishwasher and let it soak by opening half way through. Then you just add a little to each wash. It is not toxic, I checked the ingredients. We got it at our Supermarket, Publix, but you have to take your time looking for it. Good luck! Where I used to live had an older dishwasher with the white interior (don't know what it was). I read somewhere to clean a dishwasher just put orange Tang powder in the detergent pot and run with no dishes periodically; the mild acid in the tang would clean the interior of the dishwasher. I would do that every 3-4 months and it worked like a charm, no scrubbing required! I moved and now I have a stainless steel interior dishwasher. I was wondering if the Tang trick would work in it or whether it might harm the finish.